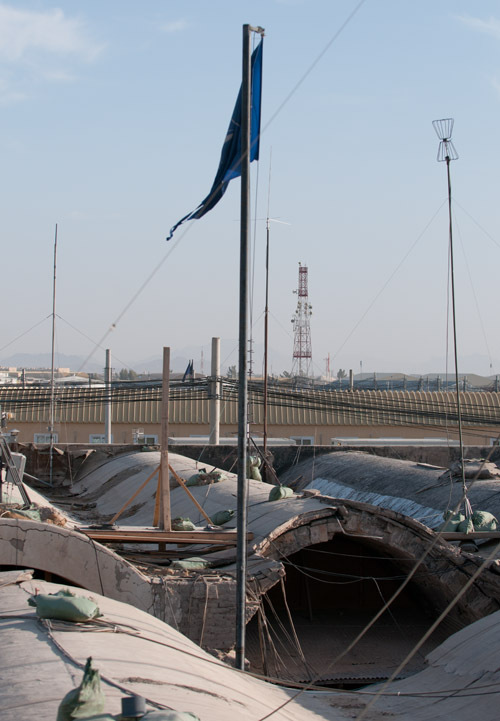 Photo by Colin Kelly//The NATO flag flies at the center of the TLS — the Taliban Last Stand building, at Kandahar Airfield, Afghanistan. At Kandahar Airfield, NATO headquarters is known as the “TLS” – the place the Taliban made its last stand. At Kandahar Airfield, NATO headquarters is known as the “TLS” – the place the Taliban made its last stand. In 2001, coalition troops launched a 500-pound bomb at the center of the half-century-old building, driving the terrorist group from its stronghold. NATO raised a flag in the spot, and today the blue and white banner still whips in the wind here. NATO made its home in the surviving perimeter, sectioning off offices with ¾-inch plywood. Brig. Gen. John Dolan, commander of KAF and the 451st Expeditionary Wing, gave Air Force Times photographer Colin Kelly and me a tour of the building – and a history lesson – during our visit this week. The U.S. Agency for International Development, USAID for short, erected the impressive structure in the 1960s to help the Afghans build up forces against the Soviet Union, Dolan told us. In 1979, the Soviets occupied it. The building eventually fell to the Taliban – until, of course, the International Assistance Security Force drove them out nearly a dozen years ago. Some of those troops scrawled their names across the walls, where they remain. Brick crumbles beneath blasted-off plaster and soot shows through whitewash in some places. There’s a “sunroom,” courtesy of the bomb, with benches, plants and strung tarp to keep out the sun in summer. For now, the commander spends parts of his days in a makeshift office where the Taliban made its last stand.